Aorus has lifted the lid on a new version of the X7 Pro which features Nvidia's frame-syncing G-Sync tech. Called the Aorus X7 Pro-SYNC, it once again features dual GTX 970M GPUs and a display that tops out at 1080p. Only the processor was different to the one in the Aorus X7 Pro we originally reviewed, taking the form of Intel's more recent Core i7-5850HQ. The big difference between the newer and model and its predecessor lies underneath its hood. Unlike the X7 Pro, which is limited to plain old V-Sync, the Aorus X7 Pro-SYNC features an embedded hardware chip that lets the GPU control the refresh rate of the laptop display. By doing this, the monitor and GPU are always in sync which eliminates tearing or stuttering during games when the frame rate exceeds the display's refresh rate. Activating G-Sync is as easy as diving into the Nvidia control panel and ticketing a box. From there on, turning on V-Sync in any game will automatically use the internal G-Sync hardware instead - and it works very well. In Assetto Corsa, the frame-rate fluctuated between around 40fps and 80fps with the graphical detail dialled up to Ultra and G-Sync turned off. With G-Sync turned on, the action smoothed and the Aorus X7 Pro-SYNC achieved a near enough constant 63fps. If there were two words to ever describe the Aorus X7 Pro, they would be "excessively powerful." This dual-970M monster easily chomped its way through every test I threw at it. Despite being thin, there's no doubt that the X7 Pro is a beast. The Aorus X7 Pro broke benchmark records left and right in our usual gauntlet of tests. Thanks to the laptop's dual GPU set up and speedy processor, we've finally recorded a Fire Strike that's over 9,000. While the Alienware 18 equipped with two Nvidia 880M in SLI was only able to rack up 8,323 points in Fire Strike, the Aorus X7 Pro has risen to the top with 10,451 points. By comparison, the MSI GT72 Dominator completed the same benchmark with 8,323 points using a single Nvidia 980M graphics card. This dual-970 machine is also a smooth performer when playing games. We use Metro: Last Light as benchmark test, because it's a resource intensive game that brings most mobile gaming rigs to their knees, and yet Aorus thin gaming machine was able to play the game with every setting on Ultra at 43.67 frames per second. Comparatively, the Alienware 18 was not able to break past 30 fps and only ran the game at 26.67 fps. The MSI GT72 Dominator was able to achieve 37 fps in Metro: Last Light. The Aorus X7 Pro ships with a decent Twisted Nematic (TN) screen ready for gaming. The color depth and blacks don't look as pristine as an IPS screen, but the Aorus' display looks better in both regards, compared to most gaming laptops we've tested. As a TN panel, it also has a high refresh rate and low response time - absolutely necessary qualities for twitch shooters like Call of Duty and Battlefield. The Aorus X7 Pro's screen also has an impeccable matte finish to it, which knocks away glare even in the worst of lighting situations. Unfortunately the audio setup on the Aorus X7 Pro leaves much more to be desired. For starters you'll be hard pressed to actually locate any actual speaker grills but it is outfitted with two speakers at the front and two additional subwoofers located on the laptop's underside. Despite all the tweeters, playing music on this machine sounds tinny and begins to distort even when just turning the system volume up to 20. Worse yet, you can barely hear the speakers over the blaring fans, which makes a headset a necessity. Gaming machines have never been lauded for their long battery life, and going with a thin chassis has cut the run time of the X7 Pro even shorter. The slim gaming rig only lasted a short 1 hour 53 minutes while running our PCMark 8 battery life benchmark tests. With regular use; browsing between seven tabs in Chrome, writing in Microsoft Word, chatting in Skype and Hipchat, all while streaming tunes on Google Music, the Aorus X7 Pro only ran for 2 hours and 5 minutes. 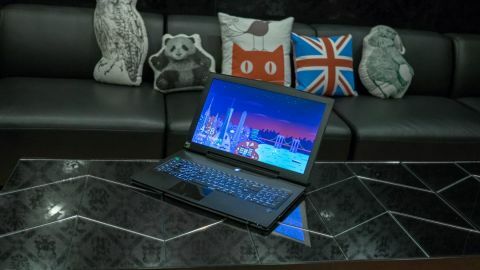 The MSI GT72 Dominator did marginally better lasting just 2 hours and 18 minutes. Even the Alienware 18 held on by just a few more minutes for a total of 1 hour and 57 minutes of run time while unplugged. The Aorus X7 Pro comes with plenty of little system management tools, giving users easy access to laptop settings and firmware updates. Each is useful in its own right but here's a short list of applications you'll want to keep running. Command and Control: A quick panel of system level controls for turning up fan speeds, turning on and off wireless radios and activating a system gauge. Killer Network: For a bit more analysis on your wireless network performance, this app provides access to data usage counters, network performance and more. Drivers Update: perhaps the single most useful application out of this lot. You can check all the drivers you have installed at a glance. You can also initiate downloads and install updates with a single click on this simple app.